Extra skin and fat hanging from the midriff can cause you dissatisfaction with your body. Tummy tuck (abdominoplasty) surgery removes the excess abdominal fat and sagging skin to reveal a flatter tummy and more defined waist. The only way to know if you are a good candidate for a tummy tuck is to consult an experienced plastic surgeon. To schedule a free cosmetic consultation in Lone Tree, please call Park Meadows Cosmetic Surgery at (720) 457-4471. You may also want to view our Before & After Gallery online! Many women choose a tummy tuck because of the ways pregnancy, aging and weight fluctuations can change the contours of the body. If you have gained weight and then lost weight, you may be unhappy with the sagging skin that has resulted. Or, if you have been pregnant before, the weight gain and skin stretching that occurs can leave drooping excess abdominal skin. With a tummy tuck, you can regain flatter, tighter abdominal skin and reduce the excess fat around your waist and abdomen. A tummy tuck is often part of a mommy makeover, which generally also includes liposuction and a breast enhancement procedure. Men can also achieve a flatter abdominal area with tummy tuck surgery. Removing the extra skin and fat can reveal more defined, masculine body contours. To enhance the definition of the waist, abs, hips and overall abdominal area, a tummy tuck procedure is sometimes combined with liposuction to remove isolated deposits of fat. 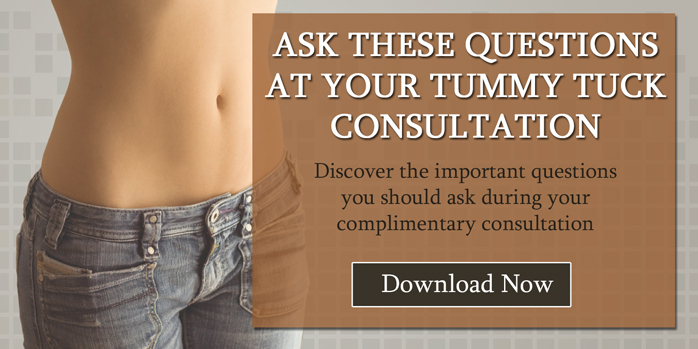 If you are unhappy with your abdominal appearance, then a tummy tuck may be right for you. Feeling ashamed or embarrassed about your midriff can affect your self-esteem and confidence. Getting a tummy tuck can allow you to rejuvenate the more youthful aspects of your body contours. We provide complimentary cosmetic consultations so you can learn more about the tummy tuck procedure and decide if it is right for you. If you are wondering if a tummy tuck in Lone Tree is right for you, please contact Park Meadows Cosmetic Surgery online or call (720) 457-4471 to schedule a free initial cosmetic consultation.